Hi- I’m no longer young and dashing, nor am I a stranger to the Fringe- but a quick read of the above was a helpful and refreshing..ummm… refresher in advance of going this year to perform *cough* BOND *cough* at Zoo Venues 🙂 But seriously… it was! I’m glad you referred to the festival as the Fringe, and not just ‘Edinburgh’, that really grinds my gears. You have passed the test. I will allow your *cough* plug *cough*. 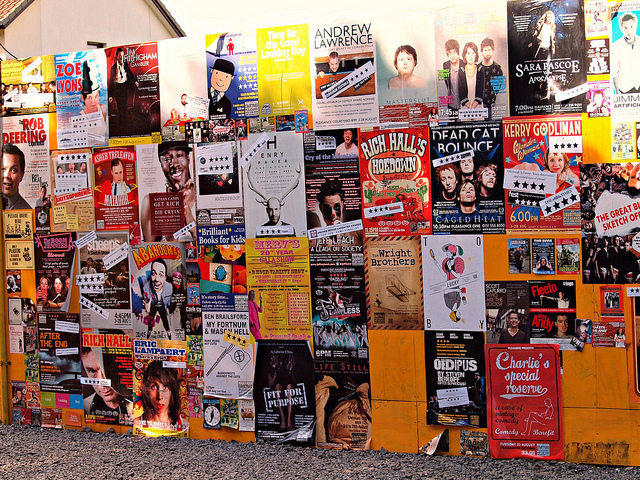 Hope you have a great time at the Fringe this year! The trick, as you say, will be to make sure your publicist knows that you trust them without looking like you’re trying to interfere. I would say follow up with them and find out how they are going to measure the impact of the campaign – is this through social media, reviews, previews, etc? – and see what you can do to help them. Ask them how you can be involved with the campaign, are there publications you want to target? Have you got a really interesting angle in your work that you think is particularly relevant or interesting to a journalist and see how you and your publicist can work together as a team to make the campaign a success. I am a stranger to the Fringe and found this piece very helpful. The article was posted in the USA to Edinburgh Facebook group, a nice bunch of folks. Thanks for your comment, and I love that Facebook group – thanks for letting me know that Pete has posted it there. He’s a good un’. Best of luck at the Fringe, you’ll have a fab time!